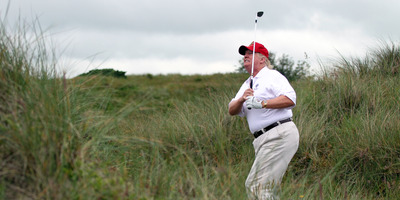 Ian MacNicol/Getty ImagesDonald Trump plays a round of golf after the opening of The Trump International Golf Links Course on July 10, 2012 in Balmedie, Scotland. President Donald Trump’s upcoming meeting with North Korean leader Kim Jong Un in Singapore could be followed by another meeting at Trump’s Mar-a-Lago resort in Palm Beach, Florida. US officials said to multiple media outlets that Trump was considering the idea of a leisurely activity with Kim, including golfing, if things go well in Singapore next week. But Trump, who was reportedly advised not to go easy on Pyongyang’s leader, was also determined to walk out of the meeting if things go sideways. President Donald Trump’s upcoming meeting with North Korean leader Kim Jong Un in Singapore could be followed by another such meeting at Trump’s Mar-a-Lago resort in Palm Beach, Florida, according to US officials cited in a Bloomberg report published this week. Trump was reportedly considering the idea of hosting Kim at his resort in the fall if his June 12 meeting goes well, officials said. A senior Trump official also confirmed Trump was considering the idea of a leisurely activity with Kim, according to The Daily Beast. “He has also discussed [possibly] golfing with Kim,” the senior official told The Daily Beast. But Trump, who was reportedly advised not to go easy on Pyongyang’s leader, was also determined to walk out of the upcoming meeting if things went sideways. Trump has repeatedly said he would walk away from the summit if he deemed it it was necessary. Some foreign-policy experts concurred with Trump’s hardline stance, pointing to Pyongyang’s nuclear weapons program. “Trump needs to do the unthinkable – again: Cancel the meeting once more or even walk out,” Harry Kazianis, the director of defence studies at the Center for the National Interest, said in an op-ed published by The Hill. Unlike Abe, it is unclear whether Kim is an avid golfer like Trump. However, North Korea’s propaganda outlet previously made claims that its former leader’s golfing prowess. As the story goes, according to the publication, Kim Jong-Il, Kim Jong Un’s father, was said to have finished his first round of golf at 38-under-par – which it said included at least five hole-in-ones.